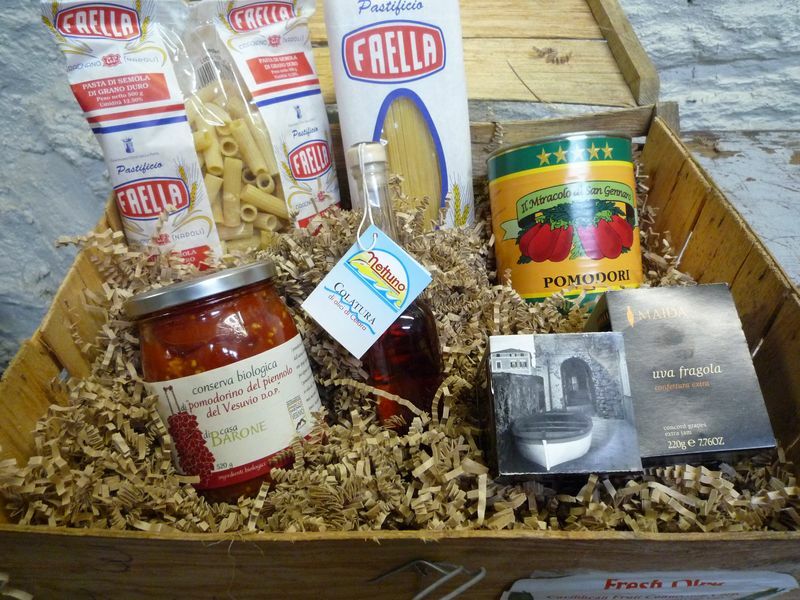 Laura Caparrotti, formerly “only” a facebook friend, sent a message asking me to donate a basket for a fund raising. We receive so many similar requests, we usually kindly decline. But Laura fund raising had a title that caught my attention. It was “Gomorrah“. 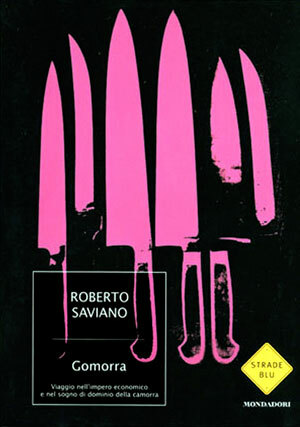 I immediately replied, Roberto Saviano‘s Gomorrah? Yes, she wrote. Anything you want, I replied. 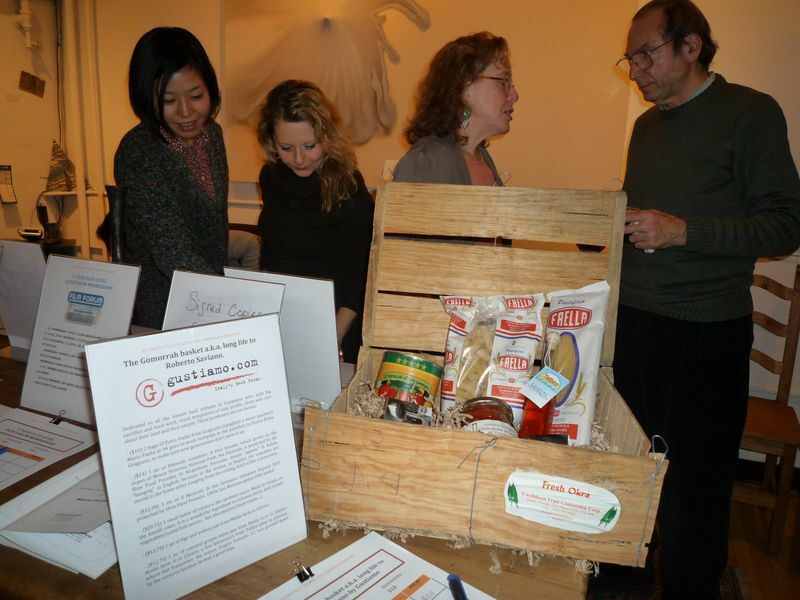 So the “virtual” relationship changed to friendship, we donated the basket and went to the event. Held in a most beautiful loft in Soho, it was a reading of some passages from Roberto Saviano’s book. Laura’s Kit-Kairos theater is raising funds to bring Gomorrah to NY and US stages. Our basket was “The Gomorrah Basket a.k.a. Long Life to Roberto Saviano”, dedicated to all the honest food artisans of Campania, who, with big sacrifice and hard work, resist temptation of easy profits; those who care about their land and their people. These producers are our heroes. – Pasta Faella from Gragnano. Mario Faella at 94 goes to work everyday in the pastificio in Piazza Roma, Gragnano, to make sure the new generations don’t mess it up. – Piennolo tomatoes from Mount Vesuvio. In Neapolitan, Piennolo, means “appeso” in Italian, “hanging” in English, because in the winter, in Naples, the tomatoes are stored in the home attics hanging from the ceiling, kind of like a prosciutto. The members of the camorra should hang, too. – Il Miracolo di San Gennaro: tomatoes beyond DOP, 100% San Marzano genes DNA tested. We don’t believe in miracles. But we would love one to get rid of the Camorra. – Colatura, the anchovy sauce. Made in Cetara, on the Amalfi coast. It is a wonderful ingredient to enhance every dish. It is so strong, you use it by the drop. Torture for the camorra would be the whole bottle in one gulp. – Walnut jam and concord grapes jam from Maida farm in Cilento, a few kilometers from Pollica (also in Cilento), where last September, the mayor, Angelo Vassallo, 57, was gunned dow by the camorra because he was a good man. What else can we do??? Long life to Roberto Saviano. You and our farmers are our heros. Previous Post Why You Have Never Heard of Olive Oil from Molise, Before? Next Post Lilly Gets It! We Hope You Do, Too!! !